Pretty much what christmas looked like for us. This is pretty much what christmas looked like for us. The first world problem of media consumption based social isolation hit our family this year during the holidays. This is what our christmastime looked like a good bit of the time, and sure it was fun, it's hard to ignore how different a family gathering is in 2011 compared to, say, 1985. This was made especially obvious since my mom gave me and my sister DVDs of old VHS tapes, several of which were past christmases, including 1985. 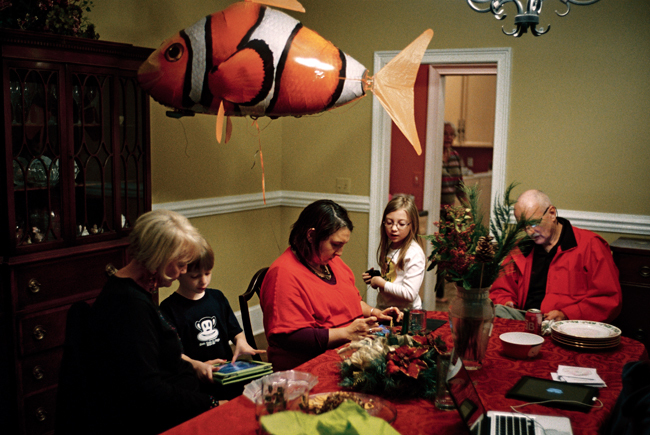 Oh, and that giant fish is an Air Swimmer my cousin's daughter was given. The adults (okay, me and my sister) played with it almost as much as they did.